Over a year ago, many predicted an Israeli engagement in #Syria in order to mud the waters. The only surprise is that it took this long. Assad regime claims that attacks are proof that rebels controlled by Israel. Why then target the puppets and not the puppet master? Anas Al-Tikriti is the son of Osama Al-Tikriti, one of the leaders of the Iraqi Islamic Party representing the Muslim Brotherhood in that country. 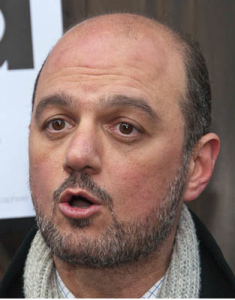 In addition to his role at Cordoba, Al-Tikriti is one of the leaders of the British Muslim Initiative (BMI), part of the UK Muslim Brotherhood. The Muslim Association of Britain (MAB) had for many years been the most active organization in the U.K Muslim Brotherhood but many of the leaders of the MAB left in 2007 to form the BMI. According to an Israeli think-tank report, the breakup appeared to be the result of a conflict between traditionalists in the MAB who were unhappy with the high level of involvement in U.K left-wing politics while those who who formed the BMI wished such activity to continue.